San Antonio Hotel near SeaWorld & Lackland AFBWhether you're visiting for leisure or business our hotel is 6 miles to SeaWorld San Antonio Texas Theme Park and 7 miles to Lackland AFB. Other great attractions and businesses are just minutes away: Six Flags Fiesta, Ingram Park Mall, San Antonio River Walk, Microsoft, and JP Morgan Chase.Experience a modern kid friendly hotel by taking a dip in our indoor swimming pool, or by getting a quick work out in at the fitness center which features state of the art equipment, or just relax in our spacious lobby sitting area by catching up with friends and family after a long day exploring San Antonio. The hotel offers complimentary high-speed Internet, free parking and free breakfast buffet every morning.Our well-appointed spacious rooms will give you a refreshing stay whether you're in town for work or play. 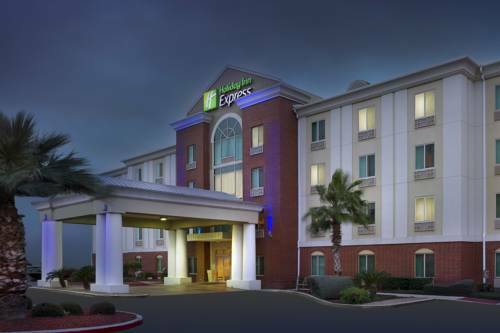 Guest rooms are equipped with free high-speed Internet, flat screen TV, spacious works, Keurig coffee maker, and iron / ironing board to give you a complete comfortable stay while you're away from home.We look forward to seeing you at the Holiday Inn Express & Suites San Antonio SeaWorld! Hearty made from scratch comfort food, draft beer served at a teeth chattering 29 degrees and all the best sports in town shown on high definition flat screens. Eat.Bowl.Play. experience features state of the art bowling, multi level laser tag, high ropes adventure courses, billiards and interactive and virtual video games, and dining. Serves hand cut steaks, fall off the bone ribs, fresh baked rolls and ice cold beer. Over 150 menu items, including tasty made from scratch full sized appetizers, nine salad varieties, fire grilled mile high burgers, over twenty super sandwich selections, three delicious housemade soups, grill favorites and much more. Classic American hamburgers and fries. Quick service U.S. chicken restaurant provides menu, nutritional information, store locator, company facts and history. Enjoy great American cuisine at this 3 story Hard Rock Cafe situated along the city's famous Riverwalk. Enjoy a large selection of American cuisine while having an adventure in this tropical paradise. Try some Turkish cuisine just minutes away from the hotel and Seaworld. Enjoy this San Antonio Mediterranean restaurant offering traditionally prepared Zablhah and Halal cuisine. Enjoy indoor or outdoor authentic Italian cuisine just down the street from the hotel. Enjoy excellent New Orleans cuisine in the heart of San Antonio. SeaWorld San Antonio is located mintues from the hotel where families and kids will enjoy this massive amusment park with world's largest sea attractions, with hundreds of friendly animals to meet, spectacular shows and over a dozen pulse-pounding rides.